Since the cleaning time has come, why not to spend it with fun? In such a manner that even the youngest members of the family will want to participate in it! We want to offer you 8 ways how to turn ordinary boring cleaning into an exciting game and develop in kids love for cleanliness. 1. Set a challenge against the clock. Set the timer and offer the kids to complete the task before it will beep! Will they be able to clear up all the toys in two minutes? If the method works, you can complicate the task and lengthen the period of time. How about to wipe clean the mirror in just five minutes? 2. Arrange a friendly competition. Everything is upside down at the kid’s room, and herewith you have two or three children? Give each one an empty basket, set the timer for a minute and see who of them will bring you more toys! You’d be surprised at how quickly the order will be restored. Prepare a list of brief instructions. “Mark: make a bed, collect dirty laundry, go to the bathroom, and put the clothes in the laundry basket.” The second child takes up the baton: “Emma: start the washing machine, take the dust cloth, go to the living room, and dust the furniture.” And so on. 4. Find out what your kids like to do. If your seven year old son loves to wash the dishes, teach him to do it properly, and strongly encourage him in doing this. Even if you occasionally have to rewash the dishes after him, just remember – you are forming a long-term skill. 5. Turn the music on! Pick a list of songs specifically for cleaning the apartment. Feel free to sing, dance, fool around and make the sound louder! Motivate the kids, promising them something nice at the end of cleaning. Hide around the house a few chocolates, some small denominations or any other pleasant “bonuses”. Tell the kids how many prizes they can find while cleaning! 8. Clean up in a mini format! 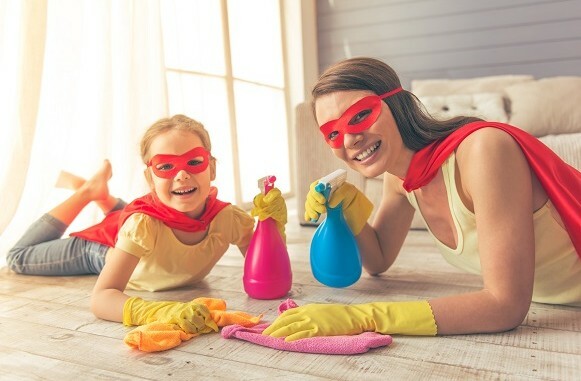 It is unlikely that kids will enjoy a deep cleaning lasting for 5 hours. But a couple of mini-cleanups during the week can even entertain them. In addition, it will engrain them a useful habit to maintain order day after day.